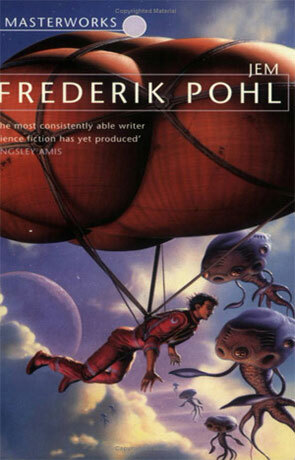 Jem is a classic science fiction novel by Frederik Pohl. Pohl writes a new book every year, this one is high on the pile of what I've read. It was just sitting simply and carefully almost precariously in the 'forget it' pile up til page 80 and then whammo! I got so jumped on with the typeface I scrambled the rest of the book. It was a race to try not ripping the pages out turning them so fast. Ya see, there's yawn politics happening that just makes you bored silly, just the set up. The earth is factioned off by who has the water (fat bloc), Oil/fuel (greasies bloc) and people (the peeps). All looking into getting to a sun just outta reach shining on one side of the planet: JEM. All the different blocs want this planet as do the species of the planet, all hungry: tunnelers, crabs, balloon ticks. Who eats who in the food chain once the humans show up tipping the natural order of things with weapons, politics, machete. Throwing some greedy and stupid bastards in the mix makes for a completely wild ride of spy vs. spy vs. spy. Some of the yahoos are shooting the aliens for fun. Who's to say no? Then the idea of giving a primitive society of aliens some modern technology.....good old homo sapiens. This one lady Margie from the military gets some perfect world plans to own the world, not thru cooperation or rational thinking either. There's a medical operation that people can have getting the 2 halves of their brain split so they may be more focused/quicker in certain areas. This little slice op makes a better alien translator.... Getting to the end of this book and what is the end of earth? (?) Jem (? ), theres a wonderful Christmas scene that will have you ripping your short hairs out. Gawd!!! whatta book. I cant really say to much more or you might not be as cored out and poured in as I was so... Jem: yes. Written on 2nd May 2002 by TC.